Chinese video-game and social media giant Tencent Holdings (NASDAQOTH:TCEHY) reportedly decided to postpone the IPO of its music streaming service until at least November, according to a report from Reuters. Meanwhile, cloud software company Anaplan (NYSE:PLAN) went ahead with its IPO to great success on its first day of public trading. The seeming contradiction in decision-making makes sense from both companies' viewpoints, and it could be of help to investors still scratching their heads after some mid-October turbulence. A company deciding to issue shares isn't about simply letting the general public in on a fast-growing enterprise. An initial public offering serves a purpose: It allows existing investors -- usually high-net-worth individuals and private investment funds -- to harvest some or all of their profits. It's also a way for the business to raise cash to fund operations. In the case of Tencent, it's likely waiting on the public debut of Tencent Music Entertainment (TME) because it doesn't need the money. TME has been around for awhile, has over 800 million users in China, and is reportedly running at a healthy profit. Majority owner Tencent -- which also runs a healthy profit as the world's largest video game publisher and one of China's leading social media operators -- is doing the best job it can to maximize returns from the spinoff for its shareholders. Tencent is expected to raise at least $1 billion from a TME IPO. Tencent's wait-and-see approach makes sense in part because of the recent turbulence in the U.S. stock market. However, another likely reason could be the prolonged pain Chinese stocks have been experiencing this year. The MSCI China index is down 30% from it's high water mark in January. Tencent shares have fared worse than average, falling over 40% over the same time period. With just about everything with "China" attached to it getting punished by investors, it makes good sense for Tencent to delay a spinoff it doesn't absolutely need. The Reuters report claims that Tencent will revisit the IPO in November, so the tech giant could be optimistic things will look better in a few weeks. 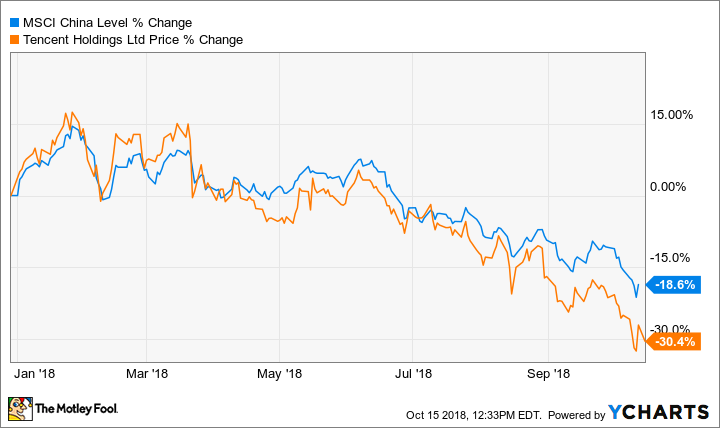 Anaplan is proof that, in spite of the damage the mid-October market pullback did, the good times are still rolling for US technology stocks. The company provides financial and business planning software. Cloud-based services like those Anaplan produces have been a best-performing batch so far in 2018. However, while it would behoove Anaplan to also try to maximize its valuation just like Tencent is trying to do with TME, it needs to balance that goal with the reality that its small financial planning software operations are burning through cash. Through the first six months of 2018, Anaplan posted an operating loss of $45 million on revenue of $109 million. That's a 40% increase from the same time period a year ago. Anaplan forging ahead with its IPO was a bet that appetite for high-flying U.S. tech stocks would remain strong. Good call, Anaplan; after initially pricing at $17, shares surged over 40% higher on their first day of trading. The company said it would be raising at least $260 million in cash from a successful IPO. Though Tencent Music is on hold for now because of the bludgeoning Chinese stocks are taking, Anaplan's success is evidence that the U.S. stock market bull -- now over 10 years in the making -- still has some legs under it. For now, anyway.